UPDATE: Click here to win these! Drawing Friday Nov 22nd! I’m a sucker for shiny. Also, anything personalized. And, of course, my kiddos. 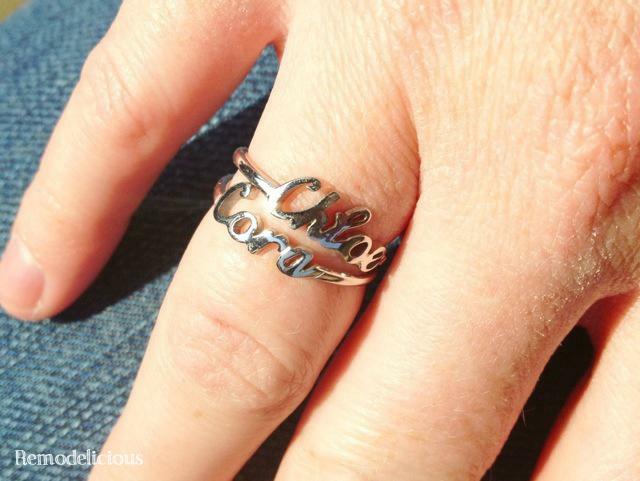 I loved some personalized name rings I saw a while back, but they were pretty spendy and never made the crossover from the “want” to “have” list. Then I found this similar style on Etsy. You pick the name, the font, and the color. Love them! Clearly, I have no shame in buying myself a gift, especially when it’s related to my “littles”. I love mom/kid jewelry because I look forward to passing these down to them one day. Jewelry is something that, to me anyway, has more value when it is passed down and has a story. At Yvonne Boutique, she also makes custom pieces using a signature. There are great opportunities for honoring a loved one or using your child’s scribbled name as jewelry. Some pieces she makes have room for stones and you can get creative.